Mommy Jane loves to spray face midst on my skin daily as it serves as an effective way to lock in moisture for young and dewy skin. With the hot season approaching, a quick spritz becomes even more appreciated. Eucerin, a brand with more than 100 years of experience in medical skin science, has been innovating dermatologically friendly products is now introducing the new Eucerin Auaporin Mist Spray with 10 in 1 benefit and has a unique formula that will boost our kin hydration by 30 times. Eucerin Aquaporin Mist Spray is more than just normal water as its key ingredient Hyaluronic Acid will ensure our skin stays hydrated longer. It able to restore water binding capacity and remain on the skin surface as it prolongs the hydration. Most important is, Hyaluronic Acid contains anti-aging properties and is able to reduce the appearance of fine line and wrinkles. Eucerin Aquaporin Mist Spray also had other ingredients that will help to brighten, replenish and soothe our skin irritations. With Glycerin which is the most effective humectant, it attracts water molecules from surrounding environment and holds on to them providing instant hydration to the skin. We will also benefit from an innovative ingredient, Gluco Glycerol, which is a blue-green algae extract and it is an effective ingredient in activating Aquaporins, the skin's own moisture distribution channels that lies deep within our skin. The Aquaporins works from within to transport moisture between the skin cells and support skin's hydration balance. Eucerin Aquaporin Mist Spray is suitable for People on-the-go who have to go out all the times and exposes to the sun and with the increase of air pollution over the years, it has a major effect on the human skin and it has been associated with premature skin aging and other skin issues. A quick spritz of the Eucerin Aquaporin Mist Spray delivers a very fine mist to provide an immediate soothing and refreshing burst of moisture to the skin. Eucerin Aquaporin Mist Spray is also a dry skin remedy since most of the time we are in air-conditioned environment due to our hot and tropical climate. 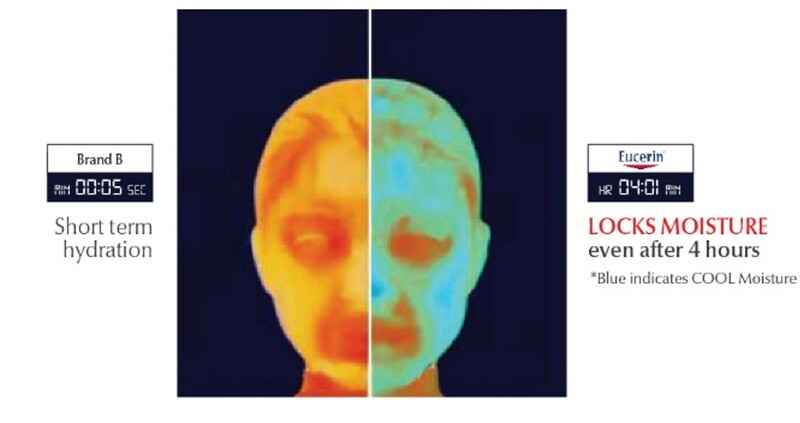 Being indoors and in the comfort of air-conditioning does not mean our skin is less susceptible to the harsh environment coz' our skin tends to lose moisture causing it to become dehydrated and dull looking. By spraying Eucerin Aquaporin Mist Spray, it allows our skin to be reinvigorated, moisturized, smooth and radiant. A spritz towards mid-day is not just a good perk-me-up but also a layer to keep our skin moist. 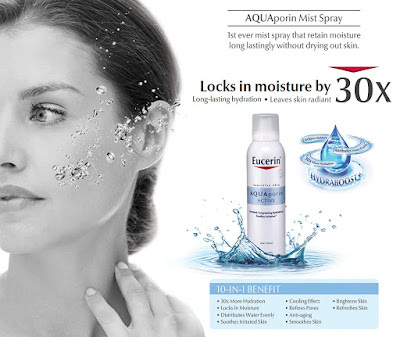 Eucerin Aquaporin Mist Spray retails at RM21.90 for 50ml and RM45.90 for 150ml. It is available at all leading pharmacies nationwide. For more details, do check out from their website at www.eucerin.my and facebook page at www.facebook.com/EucerinMY. 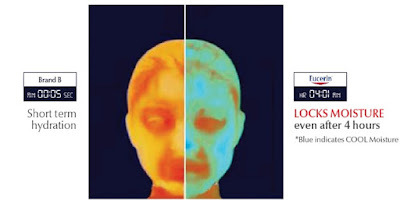 Remember to take the challenge and see yourself before and after using Eucerin Aquaporin Mist Spray. Just take a photo and write a comment on how Eucerin Aquaporin Mist Spray has helped to hydrate and brighten your skin and post it at your facebook wall with the #EucerinMistChallenge and you're on your way to win Eucerin products worth RM500. Good Luck. 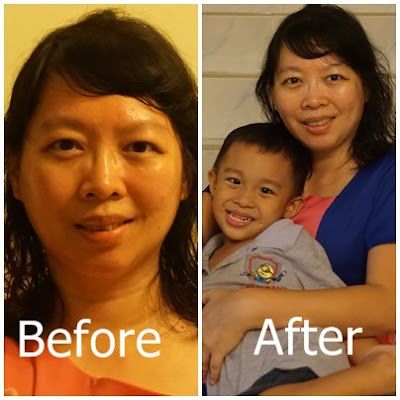 Mommy Jane had took up the challenge and results could be seen on the spot after I spray it with Eucerin Aquaporin Mist Spray. I might felt tired and exhausted after the whole day of working but with a spritz of Eucerin Aquaporin Mist Spray, I feel fresh immediately. It enhance my mood and I have more energy now to play with my Little Angels. 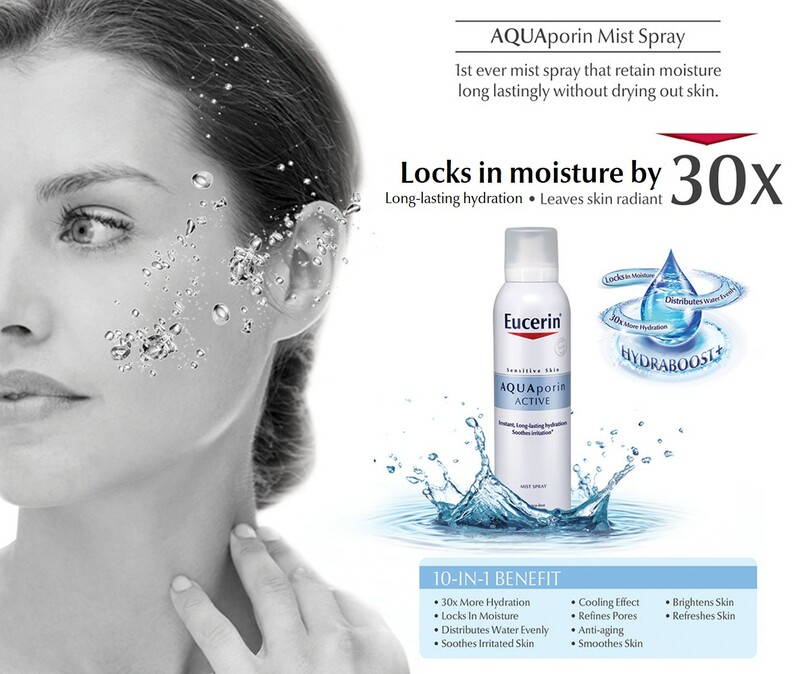 Eucerin Aquaporin Mist Spray had moisture my skin too to makes me feel younger always. You looked great Mommy Jane! I will hunt this Eucerin and try it too. Thank you for your recommendation. Blair, you're most welcome. Hope you like it too. I love using face mist!! It helps to lift up my tired face and spirit too. Eucerin is a really great products too. Sharon, when I feel tired, I spray at my face too. The feeling is really good. My sister loves their products, the only one that works well with her sensitive skin. I'll pass this information to her, too. Rika, it indeed helps out for sensitive skin. Hope your Sis will recover soon. Nice skin care. I love mist spray too. Cindyrina, me too. It helps to moisturise my skin. This brand is always so consistent and reliable. Kelly, agreed with you on this. Im gonna use it because my face need it, thanks a lot, Im gonna send this informartion to my friends. Cam, you're most welcome and thanks for sharing. Your look so glowy and radiant mummy Jane!! I love eucerin products cos its so gentle on the skin yet so effective! Everest, thanks for your compliments. I'm sure you'll too after using it. It come with small bottle and I can put in my bag easily. Betty, agreed with you. It is indeed convenient. Oliver, you're most welcome. Will check it out.